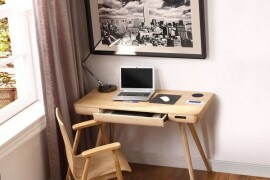 Hallways can suffer from decorating neglect as they are often just a corridor that leads to other rooms. 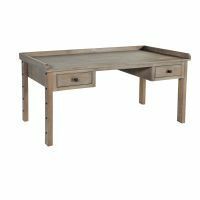 Here at The Wooden Furniture Store, we think it’s time to use the space as the first opportunity to create an inviting area with some personality, which sets the tone for the rest of your home. 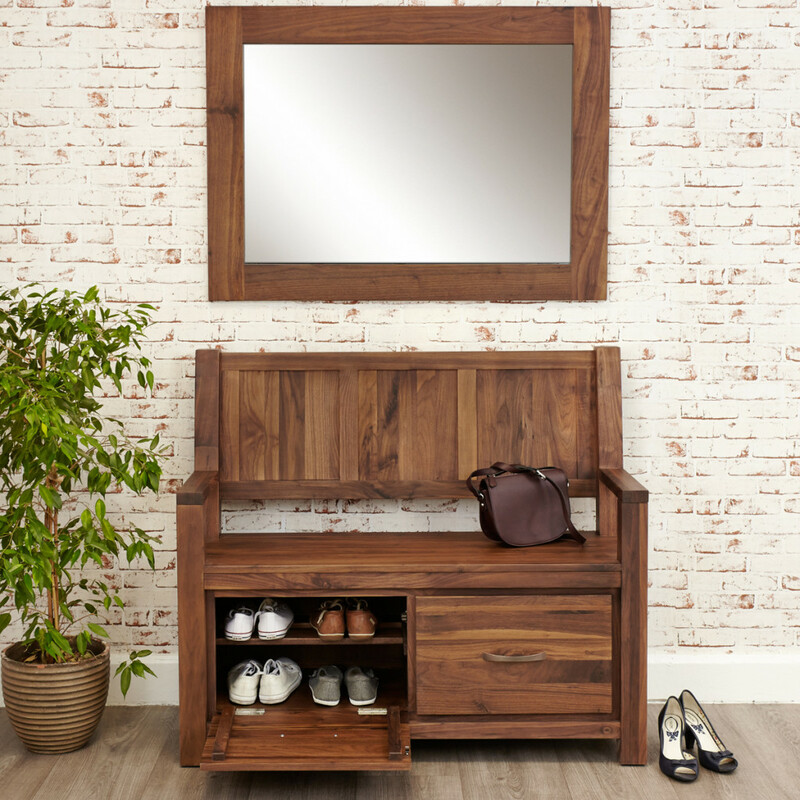 From clever furniture storage solutions, to interesting picture displays, we have ideas on how to style your hallway to give it the the wow factor. 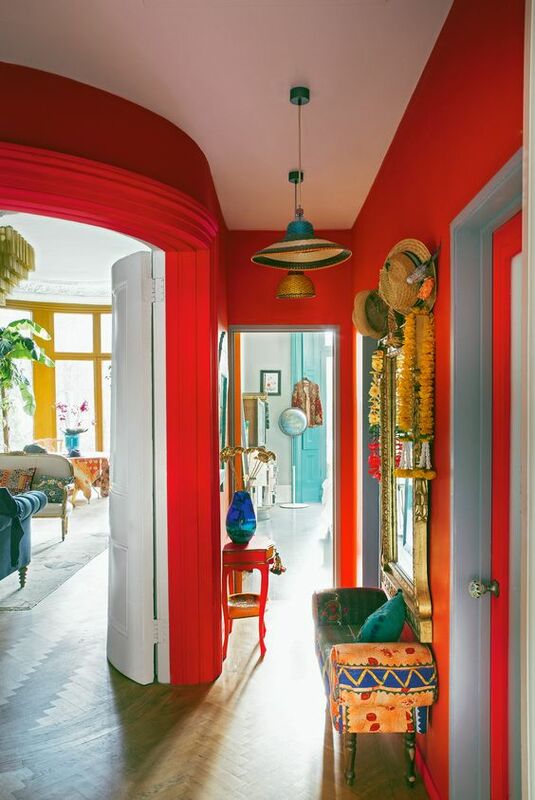 Colour is the easiest thing you can do to take your hallway from drab to fab! Start by thinking about adding some drama to your hallway and experimenting with bolder, richer paint colours and wallpapers. 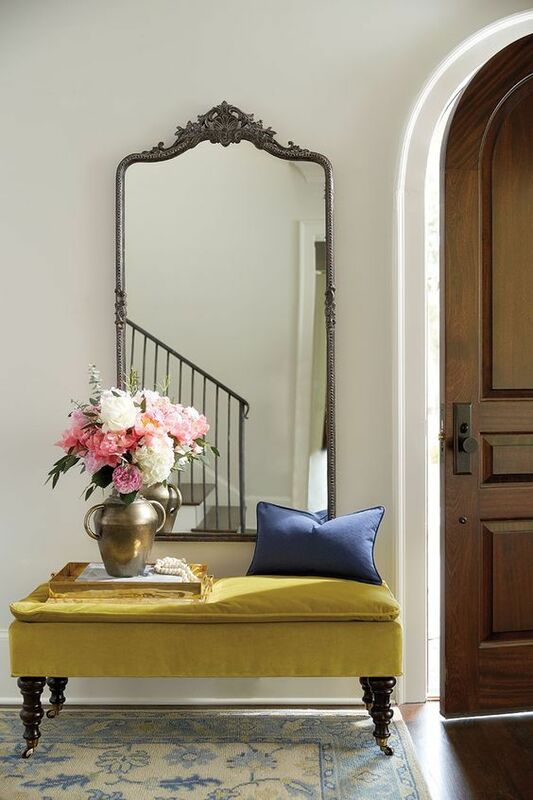 Your hallway is a transitional room, so it’s the perfect space to use colours that you like but wouldn’t necessarily use for your living room. Experimenting with exciting colour combinations is relatively inexpensive and can be changed and updated when your tire of your latest combination. We loved Matthew Williamson’s intense colour choice for his hallway, which he showcased in the March 2017 issue of Living Etc. 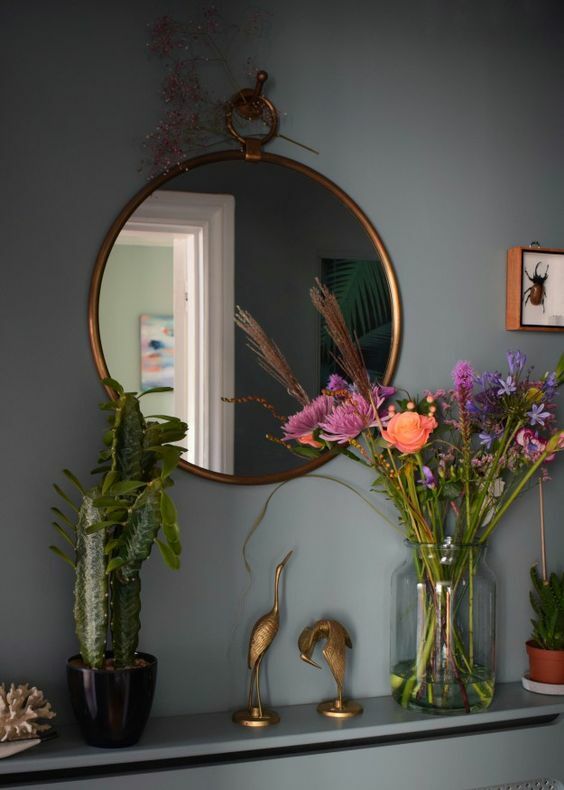 When carefully planned, dark colours can work well in small spaces and have the effect of making the rooms that lead off feel lighter and more spacious. How about teals, midnight blue or moss green? 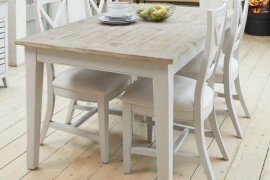 Not ready to take a risk with bold colour? 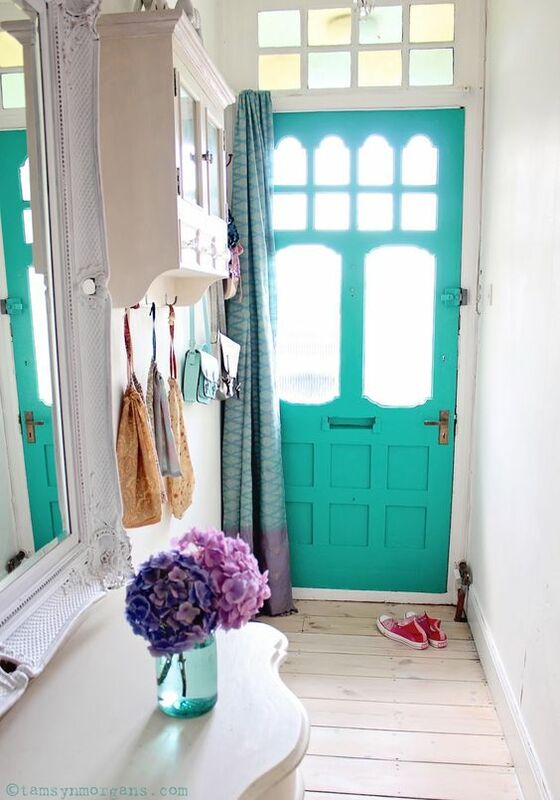 How about painting the inside of your front door instead to add some interest? 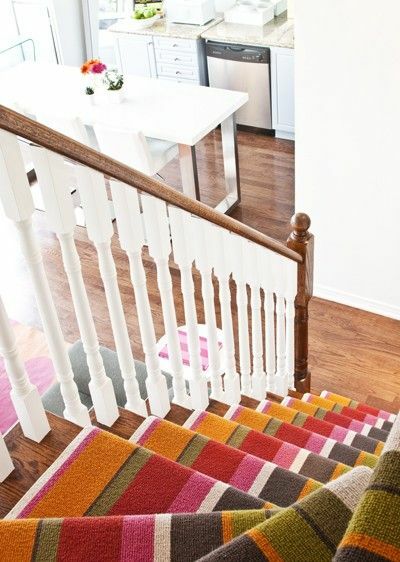 Liven up a hallway with a brightly coloured stair runner. A bold striped runner will drawer the eye up into the space a can create a contemporary feel that packs a punch. 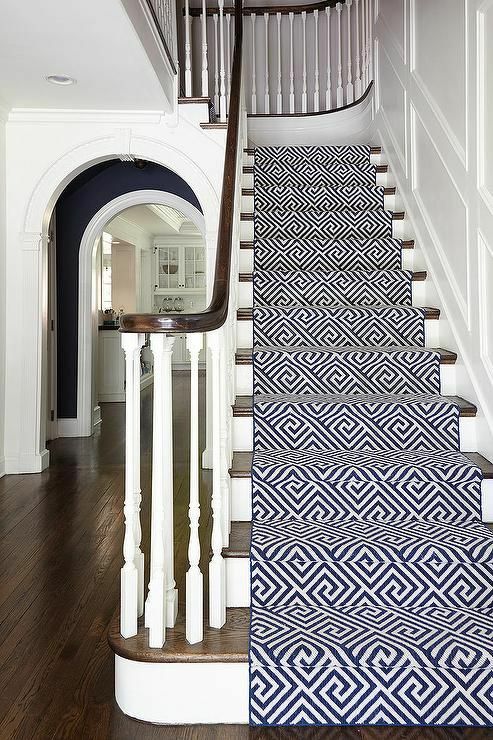 Or to stand out from the crowd go for something a bit different – strong geometrics in rich midnight blue will add interest to an all white hallway. Shoes, schoolbags and sports gear next to the front door, are never a welcome message to any guest. 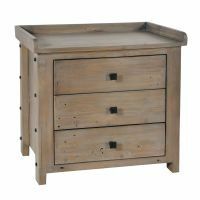 Practical hall furniture is a must for any family home and we think that the key is to invest in some clever storage solutions that look good and don’t take up too much floor space. 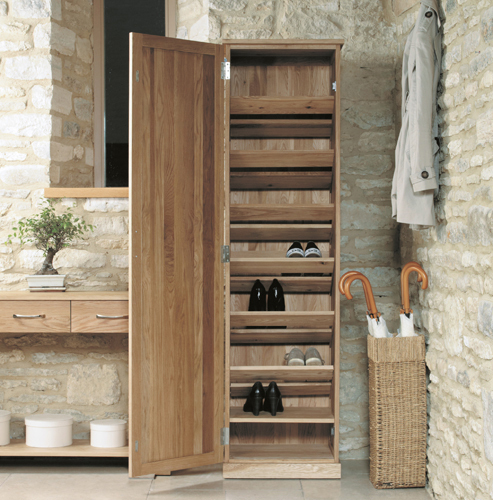 The Mobel Oak tall shoe cupboard has a small floor print but space for 16 pairs of shoes and a handy basket at the base for accessories. 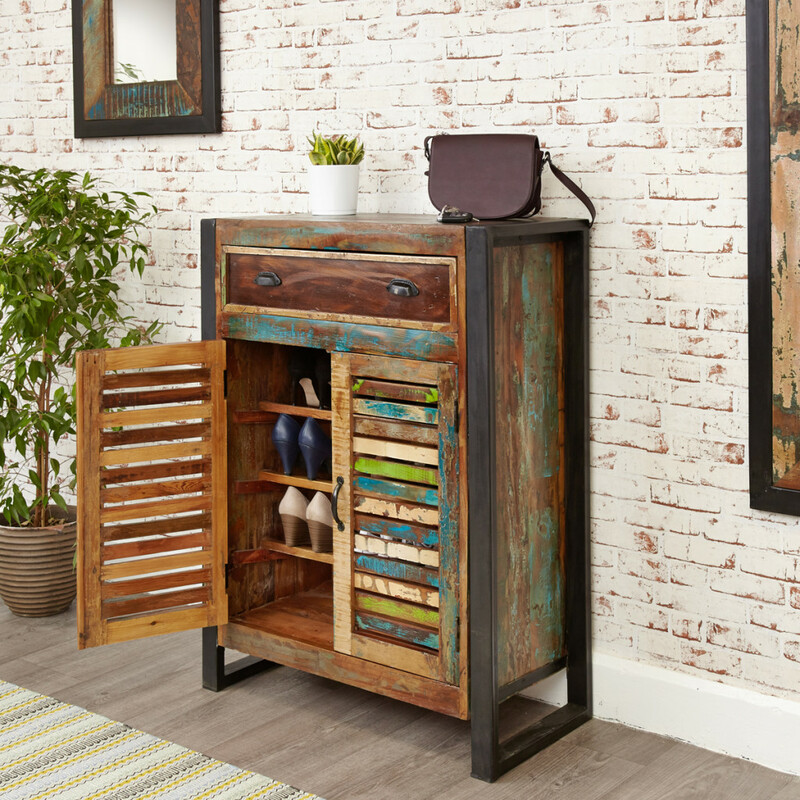 The Urban Chic shoe cupboard is an interesting design made from recycled timber that can liven up your decoration scheme and store 12 pairs of shoes. 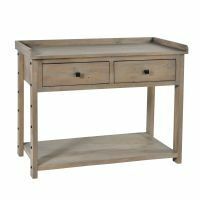 The Shiro Walnut console table is a great hallway unit that allow family belongings to accumulate, with drawers to hide all those delivery menus and spare change. 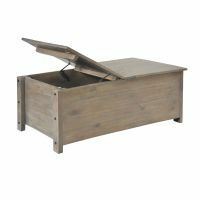 Baskets can be placed on the shelf at the base to hide away other knick knacks too. 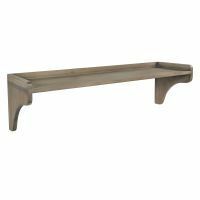 Another clever idea is to look for dual purpose furniture that doubles up as storage and seating – like the Mayan Walnut monks bench. 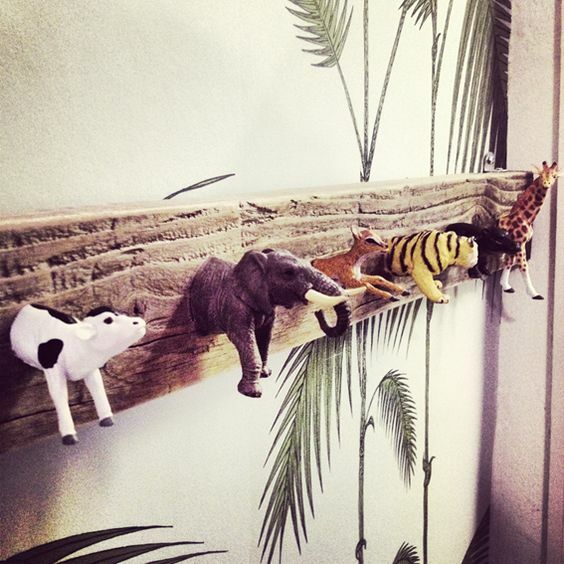 A coat rack is a handy addition in a hallway to stop clutter building up. 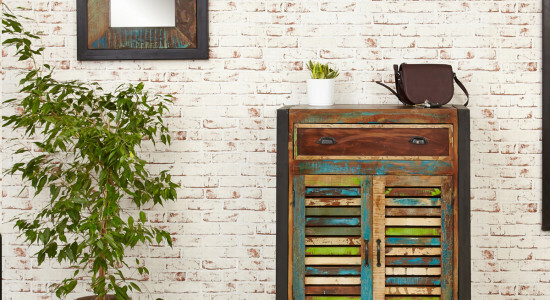 Choose an interesting design that can liven up your decorating scheme and add some character to your hallway! 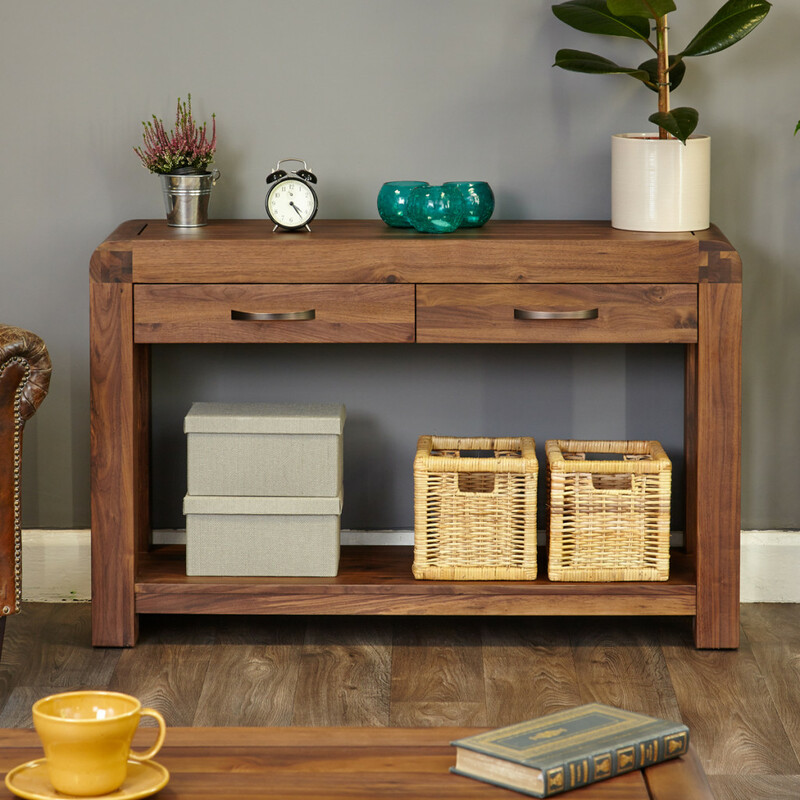 If your hallway has enough room for a console table, then you’ve got the space to make a great first impression. 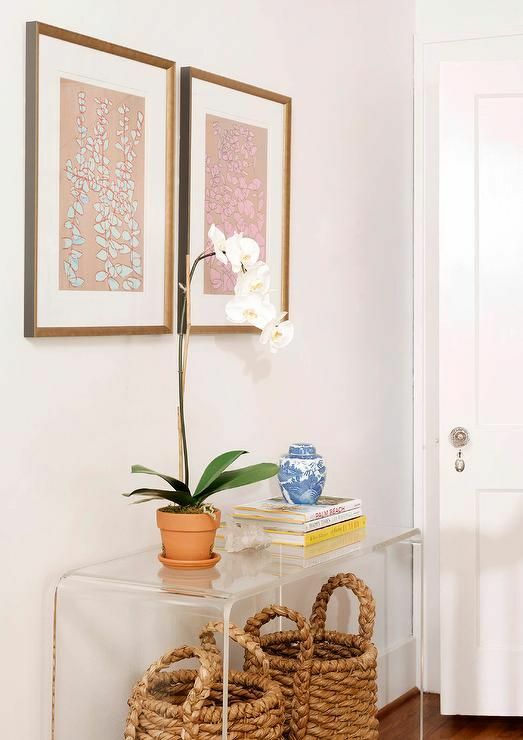 Fresh or potted flowers, or even a vase of simple green foliage from the garden, will work wonders to inject a bit of life into your hallway. 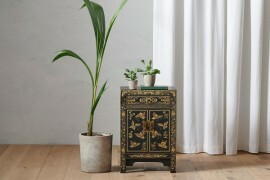 Alternatively, choose a few dazzling accessories to make an unforgettable display. 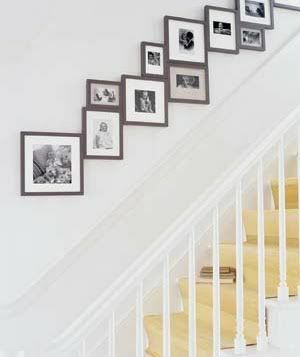 Make your staircase more interesting by creating your own gallery display. 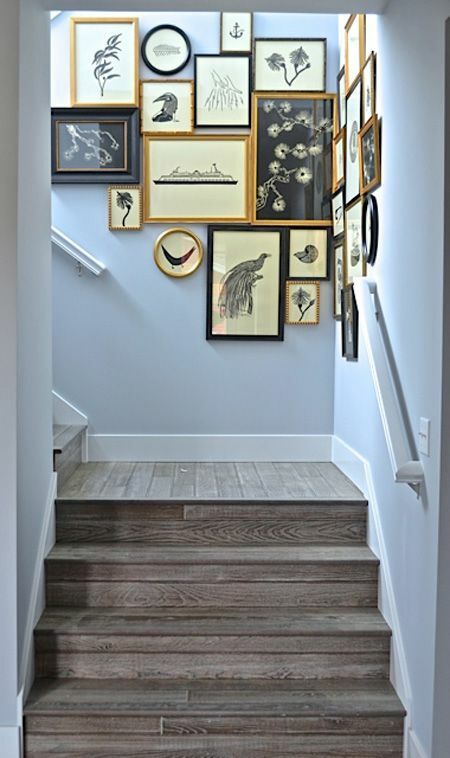 Hang your chosen collection of prints and artwork in a mix of gilt and black frames or hang and show stopper picture to make a feature wall. 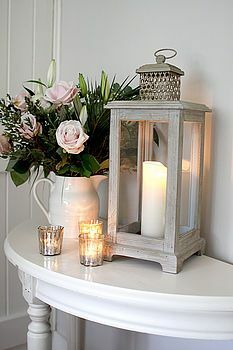 Consider placing a scent diffuser or candle in your hall to ensure your guests are welcomed with a sweet-smell, rather than a pile of smelly shoes! 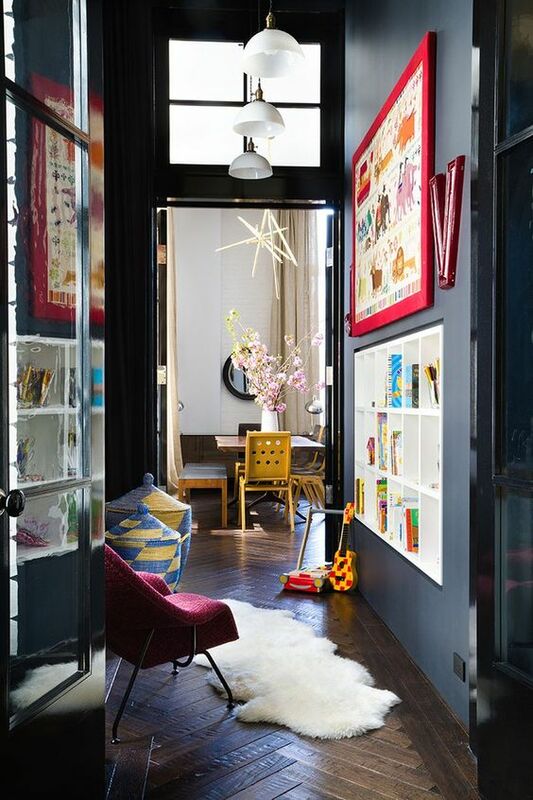 For ever more ideas on how to style your hallway for maximum impact, why not visit Pinterest?